So we have a list of engines . . .
I’ll ignore PianoTeq cos its propriety . So how many of these can we produce a standard level sine wave for? I’ve not done much with LV2 plugins as yet so I will look at this simple set initially. 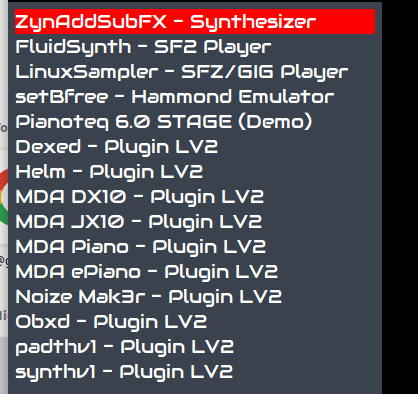 I’ve not done much with LV2 plugins as yet so I will look at this simple set initially. Perhaps this is the solution? Loading a WAV file with a sine wave with given amplitude should work, or? I’m reading up on levels. I don’t have a scope or a ppm altho’ I’ll try to hunt a software one out at some later point. I’ll be using the Nord Modular as my reference and will cancel the sine wave with one generated by the Nord as a level indicator and I’m building waveforms with Audacity, which I’ll use polyphone to build a fluidsynth file. Once I’m happy with levels I will try each engine to build a sinewave there. Hopefullt we should get a little basic tutorial for the engines if nothing else. So how many of these can we produce a standard level sine wave for? I think the 4 engines you say can generate a “more or less” pure sine wave.